Zimride is an online carpooling service that focuses on college, university and corporate communities to ensure that they always have a critical mass of users necessary to sustain the service as a reliable form of transportation. Zimride uses Google Maps for users to set the starting and finishing points of the journeys that they wish to undertake. The journeys can be one-time trips, regular commutes, or cab shares. Zimride also uses Facebook Connect so that users can connect and establish trust. After you have entered the details of your journey on the Google Map Zimride returns the results of everyone offering or seeking a ride for that route. The members offering a lift on that route are also tagged on the map so that you can see at a glance which ones are nearest to you. 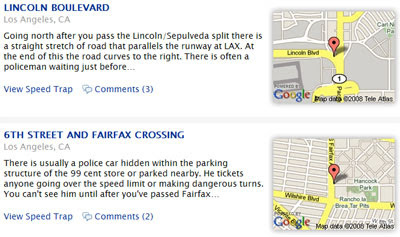 eRideShare.com is another car pooling website that is using Google Maps to promote its service. You can use eRideShare.com to find either daily carpools or for a lift for a one off journey. eRideShare.com requires users to register for the service but it is free to use. Sponsored by the National Motorists Association SpeedTrap.org is a website for drivers to report and find the location of speed traps. To search for speed traps in your locale simply enter your state and city and SpeedTrap.org returns a list of speed traps, each with its own handy Google Map. The UK's Automobile Association (AA) has produced a Google Map showing live traffic conditions on the country's roads. 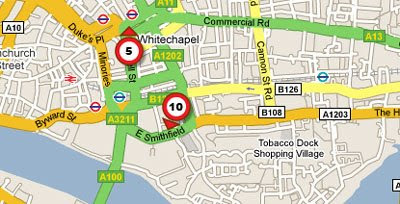 Red circles on the map show the speed (mph) of traffic in the direction of an arrow. If you don't see any red circles, you can zoom out, or move the map with your mouse to find possible problems in the surrounding area.